Images via Greywolf, Cleveland Museum of Art, Picador and Mouthmark. Since the November election of Donald Trump, the question “How did we get here?” has bounced around the internet and through print media. Despite the emerging genre of “this writer predicted Trump,” there is no single answer, no one text or prescient writer, there is no single book that predicted Trump’s election or the anger and disillusionment of those who voted for him. Instead, there is a range of potential answers, of histories and experiences from which to draw, often broad and conflicted. Collected below is a somewhat arbitrary collection of books and essays that attempt to provide a bit of critical understanding of how we got here. It also includes books that demand a critical assessment of American culture, asking questions with impossible answers. Though this list might be exhausting, it’s not exhaustive. It’s primarily focused on work produced post-war—there are no Founding Fathers on this list—and includes a range of genres, including poetry and the visual arts. The division into two parts is an easy way to sort genres (non-fiction from literary non-fiction or fiction) but the same themes run through the entire list. Unlike syllabi and reading lists published elsewhere, this list is neither academic nor focused on a singular topic (If you’re interested in academic syllabi, check out Marcia Chatelain’s Ferguson Syllabus or Public Books’ Trump Syllabus 2.0; for readings on resistance, see The New Inquiry’s “A Time for Treason”). Instead, it’s a loose, two-part collection of history, critical essays, novels, memoirs and works of art that hopefully navigate to a better understanding of nationalism and the lives lived within that constrictive ideology. There are some familiar—and perhaps obvious—selections here, but hopefully some lesser known work as well. Throughout the next few months, we’ll be interviewing some of the writers on this list or academics who specialize on pertinent writers whose work has outlived them. Please share your suggestions in the comments. “Vulnerability, understood as a deliberate exposure to power, is part of the very meaning of political resistance as an embodied enactment,” Judith Butler said in a 2014 lecture. For all of the talk about the shunned and angry blue collar white voter who swept Trump into office, the issue of vulnerability—physical and political—has been lost in nearly every post-election rundown. This section attempts to historicize that vulnerability, particular the purposeful creation and continued maintenance of politically vulnerable populations in the rhetorics of nationalism and fascism. It moves from some landmark reading on the fundamentals of nationalism, including Adorno and Ardent, particularly as it manifested in mid-century Europe to some landmark texts on American history. Beyond those foundational readings, there is also a consideration of identity—of race and gender and class, but also of what was formerly considered the fringe right, now so mainstream it sits in the White House. Susan Faludi’s Stiffed and Keeanga-Yamahtta Taylor’s sharp history of Black Lives Matter are bookends of sorts, tracing the search for justice with its increasingly angry pushback. Theodor Adorno, “Freudian Theory and the Pattern of Fascist Propaganda,” 1951. Hannah Arendt, The Origins of Totalitarianism, 1951. Umberto Eco, “Ur-Fascism,” New York Review of Books, 1995. Michel Foucault, Society Must Be Defended, 1976. Judith Butler, “Rethinking Vulnerability and Resistance,” 2014. ___. Precarious Life: The Powers of Mourning and Violence, 2006. Angela Davis, Freedom is a Constant Struggle, 2016. Eric Foner, Reconstruction: America’s Unfinished Revolution, 1988. ___. The Story of American Freedom, 1999. Richard Hofstadter, Anti-Intellectualism in American Life, 1966. Herbert Marcuse, “Repressive Tolerance,” in A Critique of Pure Tolerance, 1969. Gayatri Spivak, A Critique of Postcolonial Reason, 1999. Matthew Desmond, Evicted: Poverty and Profit in the American City, 2016. Barbara Ehrenreich, Nickel and Dimed, Not Getting by in America, 2001. Louis Hyman, Debtor Nation: The History of American Red Ink, 2011. Jane Mayer, Dark Money: The Hidden History of the Billionaires Behind the Rise of the Radical Right, 2016. David Aaronovitch, Voodoo Histories: The Role of the Conspiracy Theory in Shaping Modern History, 2010. Susan Faludi, Stiffed: The Betrayal of the American Man, 1999. Arlie Russell Hochschild, Strangers in Their Own Land: Anger and Mourning on the American Right, 2016. Jesse Walker, The United States of Paranoia: A Conspiracy Theory, 2013. Lauren Alwan, “Arab Past, American Present: My Family’s Invisible History,” Catapult, 2017. Moustafa Bayoumi, How Does It Feel to Be a Problem? Being Young and Arab in America, 2009. Thomas Holt, Children of Fire: A History of African Americans, 2011. Susan Lobo & Steve Talbot, Native American Voices: A Reader, 2000. Keeanga-Yamahtta Taylor, From #BlackLivesMatter to Black Liberation, 2016. Gloria Anzaldúa & Cherríe Moraga, This Bridge Called My Back: Writings by Radical Women of Color, 1988.
bell hooks, “Sisterhood: Political Solidarity Between Women,” Feminist Review, 1986. Judith Butler, Undoing Gender, 2004. Hélène Cixous, The Laugh of the Medusa, 1976. Angela Davis, Women, Race & Class, 1983. Donna Haraway, “Cyborg Manifesto,” 1984. Audre Lorde, Sister Outsider: Essays and Speeches, 2012. Adrienne Rich, “Compulsory Heterosexuality and Lesbian Existence,” in Feminism and Sexuality, 1996. Julia Serano, Whipping Girl: A Transsexual Woman on Sexism and Scapegoating Femininity, 2007. A reading list wouldn’t be complete without the novel, the memoir, poetry, and works of art; history and critical reading might direct us toward a path of understanding, but it’s often art and literature where the application or questioning of that understanding takes a critical turn. This section begins with the memoir, looking at works that explore the impact of politics on the individual, from Edwidge Danticat and Aleksander Hemon’s exploration of otherness to Maggie Nelson’s meditation on queerness and empathy to Daisy Hernandez’s personal account of race and sexuality. It moves then to fiction, including a collection of books that are largely unrelated but which, I hope, articulate some of the broader issues of our contemporary culture. Under fiction, you’ll find Jennine Capó Crucet’s story of Lizet, the daughter of Cuban immigrations struggling with identity at a prestigious American university and Leila Aboulea’s Najwa, a Sudanese refugee in London trying to come to terms with her new reality. Included too are the science fiction novels of Octavia Butler which, despite the well-deserved love for Margaret Atwood, are still the most trenchant fictions of self-alienation (plus, let’s give Butler some credit for seeing the slogan, “Make America Great,” on the horizon). Lastly, there are a handful of novels about women’s rage which Monique Wittig, Han Kang, and Charlotte Wood render with a painful grace. It then moves to poetry, an admittedly light section, compiled with the help of Rachel Vorona Cote. This section ends with the image which, in the era of Trump, seems increasingly important; first, a handful of iconic writers exploring how the image, be it the photograph, painting, film or even television, works on us, simultaneously creating and reinforcing cultural norms. 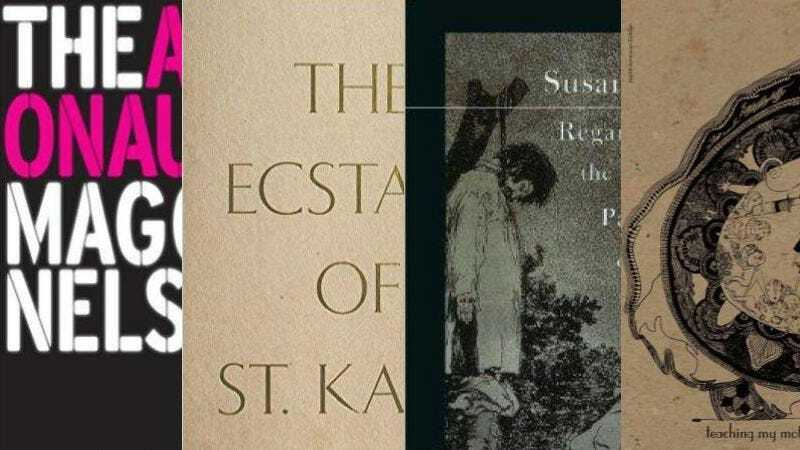 From John Berger to Walter Benjamin and Susan Sontag, each of these critics were trenchant observers and offer varying methods to see and reflect on the array of images we’re confronted with in an increasingly rapid pace. Finally, it turns to artists working today, a group largely selected because they ask difficult questions about nationality and identity. The series Border Cantos (video above) evokes the sounds of items abandoned along the border while Mona Hatoum’s Door Mat, a welcome mat constructed from sharp pins, seems even more relevant than when she first exhibited it in 1996. Alison Bechdel, Fun Home: A Tragicomic, 2006. Edwidge Danticat, Brother, I’m Dying, 2004. Erica Fisher, Aimee & Jaguar: A Love Story, Berlin, 1943, published 1995. Aleksandar Hemon, The Book of My Lives, 2013. Daisy Hernandez, Cup of Water Under My Bed, 2015. Maggie Nelson, The Argonauts, 2015. Jesmyn Ward, Men We Reaped, 2014. Julia Alvarez, In the Time of Butterflies, 1994. Octavia Butler, Xenogenesis Trilogy, 1984-89. Jennine Capó Crucet, Make Your Home Among Strangers, 2015. Leslie Feinberg, Stone Butch Blues, 1993. Han Kang, The Vegetarian, 2016. Viet Thanh Nguyen, The Refugees, February 2017. Jeannette Winterson, Written on the Body, 1993. Monique Wittig, Les Guérillères, 1969. Colson Whitehead, The Underground Railroad, 2016. Charlotte Wood, The Natural Way of Things, 2016. Essex Hemphill, Ceremonies: Prose and Poetry, 1992. Ladan Osman, The Kitchen-Dweller’s Testimony, 2015. Hawa Allan, “Confronting the Unreal Under President Trump,” Literary Hub, 2017. Jean Baudrillard, Simulacra and Simulation, 1994. Walter Benjamin, “The Work of Art in the Age of Mechanical Reproduction,” 1936. John Berger, About Looking, 1992. Guy Debord, Society of the Spectacle, 1967. Umberto Eco, Travels in Hyperreality, 1973. Elena Ferrante’s letters on Silvio Berlusconi in Frantumagalia, 2016. Maggie Nelson, The Art of Cruelty: A Reckoning, 2011. Susan Sontag, “Fascinating Fascism,” New York Review of Books, 1975. ___. Regarding the Pain of Others, 2003. Mona Hatoum, Domestic Disturbance and various monographs, 2001. Nikki S. Lee, Projects, 2001. Kerry James Marshall, Mastry, 2016. Richard Misrach (photographer) & Guillermo Galindo (composer), Border Cantos, 2016. Catherine Opie with Eileen Myles, Inauguration, 2011. Kara Walker, The Ecstasy of Saint Kara, 2016. See also the work of Xaviera Simmons, Simone Leigh and Black Women Artists for Black Lives Matter.